Horses are non-ruminant animals with a relatively simple digestive system. On a basic level, ‘non-ruminant’ means the equine stomach consists of one digestive chamber, as opposed to four which can be found in livestock animals such as domestic cattle, sheep and deer. Ruminant animals can digest (and re-digest) large amounts of low-grade food (i.e. grass) and extract optimal nutrition from it. As the horse is a non-ruminant animal with a stomach that is small in relation to its overall body size, it is prone to a number of gut and digestive problems. Because the stomach has only one opening valve which stops food from being regurgitated, if anything is consumed that upsets the digestive tract, it must continue through the system before being passed out. Horses can experience a range of digestive complaints ranging in severity, from mild cases of gas, indigestion and diarrhoea, to more severe incidences of inflammatory bowel disease and gastric ulcers. While the more serious conditions are rare, cases of equine diarrhoea are extremely common. Diarrhoea can be caused by a host of reasons, from antibiotics and worming to a sudden change in diet, intestinal flora imbalance, organ function change, and stress (i.e. from showing, travelling etc), but whatever the cause, the effects of prolonged diarrhoea to a horse can be life threatening. The nature of a horse’s stomach makes it better suited to digesting small meals more regularly, rather than a large meal once or twice daily. Adding chaff (chopped hay) to feed can also slow the feeding and chewing process, meaning the stomach does not get uncomfortably full. Having hay or roughage on offer in the paddock/stable, as well as clean water, is also a useful way of keeping your horse’s stools regular and reducing the chances of diarrhoea or colic (hay is a great absorber of stomach acid). If a horse goes without food for a long period of time, excess stomach acids can cause indigestion and heartburn and, in more extreme cases, gastric ulcers. When a horse has acute diarrhoea that is brought on rapidly and takes the form of very loose and profuse stools (with blood or mucus) it can become dehydrated very quickly which can, in turn, lead to laminitis and kidney failure. If acute diarrhoea is not treated immediately, a horse can lose up to 40 litres of water and electrolytes in a single day. If your horse has acute diarrhoea with accompanying signs of colic, fever, loss of appetite or depression, it is important to seek immediate veterinary advice. A vet will be able to identify the cause of the diarrhoea and administer treatment which could save the animal. If your horse experiences more chronic diarrhoea which lasts a couple of weeks without accompanying symptoms, it is still vital to get a veterinary exam for your equine as there may be an underlying reason for its condition. The exact cause of chronic diarrhoea is more difficult to place, although common explanations are a change in diet or a poor quality diet (including food that is mouldy or passed its best), excess water/grain/grass intake, consumption of sand, or an infection (i.e. Salmonella). Chronic bowel, gastrointestinal and liver problems are also known to cause looser stools, so it is worth getting your horse checked out. To help support the digestive function in horses, Protexin is an effective probiotic treatment that works to balance natural gut microflora and restore stomach conditions to a healthy level, thus minimising digestive upsets. The product comes in a range of easy-administer formulas from pastes to powders and works to soothe and re-balance the stomach lining following a bout of diarrhoea. The formulation can also be used as a preventative measure prior to showing or travelling when a horse is likely to experience high stress. 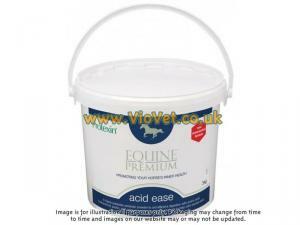 Protexin Gut Balancer, Quick Fix, Pro-Kolin, Gut Bind, Pro-Paste, Pro-Digit, Recovery Aid and Acid Ease Concentrated can all be purchased here at VioVet. Hi my mare has recently finished a 2 month course of Gastrogard.Has now been turned out onto good grass for approximately a month but noticed the last few dayz has very sloppy poos! i have put her on Acid Ease is this correct? or should it be Gut Balancer? i am assuming the issue is down to the grass and current heatwave.